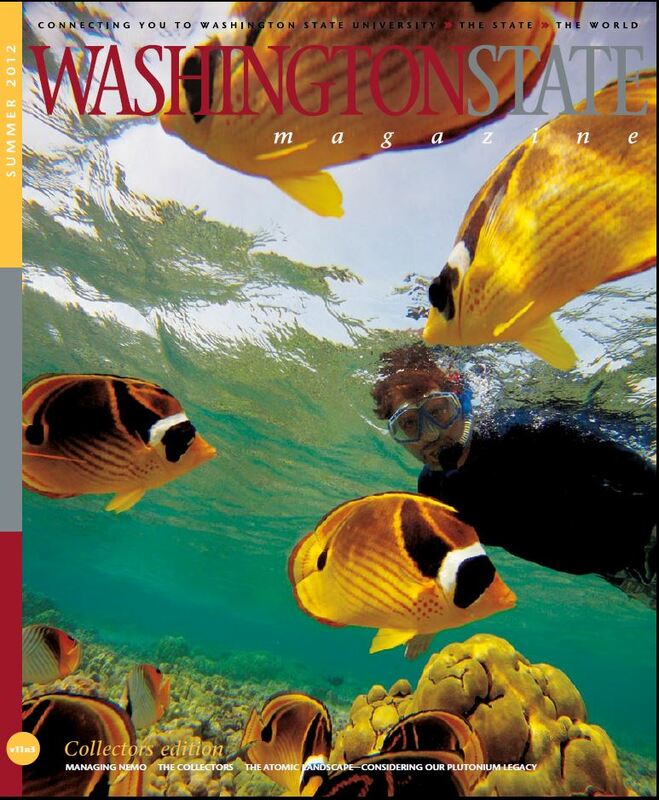 In early 2012 I traveled with Washington State University Science Journalist extraordinaire Eric Sorensen to Hawaii so he could write an article on my research on the Hawaii aquarium trade, which has been ongoing since the mid-1990s. At the time of the article things were heating up between aquarium collectors and Snorkel Bob’s crusade to shut them down in Hawaii. Since then, conflict has escalated to the level of a very public physical confrontation, as described in a balanced and well researched piece by Ret Talbot published in Coral magazine. As a scientist I have tried to provide objective information to inform fishery management plans and policy and not engage in the debate over the fate of the trade in Hawaii. THE ISLAND OF HAWAII, lest it be confused with the state of Hawaii, is often referred to as the Big Island. In fact, it is the biggest of the Hawaiian Islands. But in many ways, it is like a small town, as Brian Tissot has once again realized upon returning earlier this year. On short notice, he has scheduled a talk in the Kealakehe High School Library in Kailua-Kona, the largest town on the island’s west coast, also known as West Hawaii. And in the days leading up to the talk, most everyone he meets has heard he will be speaking. Even an old acquaintance from across the island in Hilo, where Tissot was once a University of Hawai‘i professor, caught wind of the talk. A traveling companion swimming off the town’s waterfront met a woman from Alberta, Canada, who has also heard about it. Tissot, accustomed to crowds of ten or so people on the WSU Vancouver campus, is excited about the prospect of a full room. He is nervous, too. His subject—the West Hawaii aquarium fishery, home to an array of charismatic, brightly colored creatures like those in the movie Finding Nemo—has for years been the subject of often bitter debate and worse. Since then, Tissot, a marine scientist, has become a key figure in the fishery. He has documented the impacts of aquarium collectors and the ability of the reef to recover when areas are closed to collecting. He and his colleagues have shown how protected areas can “seed” unprotected areas with fish and larvae. In the first study of its kind, they mapped genetic connections between fish and their offspring miles away—a needle-in-a-haystack accomplishment writ across tens of thousands of square miles of water. “Brian was the foundation of aquarium science here in Hawaii,” says Bill Walsh, an aquatic biologist for the Division of Aquatic Resources and the state’s top fish scientist in West Hawaii. To Tissot, the West Hawaii fishery shows how a mix of science- and community-based management can reconcile competing interests and points of view to conserve a treasured ocean resource. Alongside similar efforts off Florida and Australia’s Great Barrier Reef, it could be a model for conservation activities elsewhere. In particular, Tissot and a number of other researchers are concerned about the trade in aquarium fish, corals, and other items from the western Pacific’s Coral Triangle, home to the richest, most diverse reefs in the world and a region of relatively lawless collecting. Central to that is the network of people needed to forge a consensus on what directions to take. In a way, the fishery is a tidy, self-contained example—an aquarium unto itself—filled with the elements common to so many other fisheries struggling to responsibly manage stocks in the face of a hungry, growing, and interconnected global economy. It is subjected to deep and responsive scientific study from the likes of Tissot, Walsh, and others. It has several marine protected areas, darlings of the conservation world whose value reaches well outside their borders. And its voluntary management council has poured thousands of hours into smoothing out more than a decade of controversy to reach a consensus on the fishery’s direction. To Tissot, the West Hawaii fishery is a marvel of modern marine policy, an admirable blend of conservation science and sociology, or “integral ecology,” capable of pointing the way for embattled fisheries around the world. As Tissot sees it, an advocate like Wintner uses the science that suits him and blows off the rest. A scientist has to play by different rules. His terms of engagement call for acknowledging and giving good weight to other points of view. Tissot has opinions, but he doesn’t want to conflate them with his science, or shed the rigorous, impartial, redundant, and peer-reviewed scrutiny of science. Just a few days before his talk at the library, he hears Snorkel Bob might be there. BRIAN TISSOT was a Navy brat. His dad, Ernest Tissot, flew 309 combat missions in Korea and Vietnam, was the third Navy aviator to land more than 1,000 times on an aircraft carrier, commanded the massive nuclear-powered aircraft carrier USS Enterprise, and retired as a rear admiral. This had several implications for the younger Tissot. His first major was journalism, and he knocked off a suite of photography classes. He was living at the beach 10 miles from campus, hitchhiking to class. One day he was picked up by a marine biology professor, who told him he wouldn’t need to take any prerequisite science courses to enroll in his class. While he used to sit on the beach waiting for waves, he would now walk the shoreline. He developed an interest in black abalone, a dark sea snail with an iridescent pink and green interior. He finished his undergraduate years studying their diet and growth. For two years after graduation, he worked for the Diablo Canyon nuclear power plant, studying how abalone were affected by the plant’s warm-water discharges. While getting his master’s at the University of California, Irvine, he met marine biologist Mark Hixon, who lured him to Oregon State University for a doctorate. Two years into his studies there, he started seeing fewer abalone. In 1988, there were a fifth as many as the year before. It turned out the abalone were stricken by a bacterium that inhibits their digestive tract. Their feet, which they use to store carbohydrates as well as move and anchor themselves, wither away, making them more vulnerable to predators and starvation. Tissot looked for them in remote places left relatively untouched by fishing, like Santa Cruz Island, in southern California’s Channel Islands. He sailed on a converted destroyer to Mexico’s Guadalupe Island. Upon arriving, the crew was told they had to leave in a matter of hours. It almost didn’t matter; all Tissot found was shells. IN 1979, Tissot was basking in one of the Seven Pools of Hana, on the island of Maui, when he spotted a long form in the distance. He wondered out loud what it was. “That’s the Big Island,” said his brother. Truth be told, Tissot is prone to moments. He had another one the next year, when he visited West Hawaii and dove north of town. A strong ocean surge sent water in and out of the black lava cliffs and underwater caves. Against this backdrop, clouds of fish swirled back and forth, going with the flow, moving in to pick at rocks before streaming out. Tissot documented the scene with an underwater 8-millimeter movie camera, or thought he had before realizing he forgot to load it with film. And in a move familiar to many Hawaii visitors, from smitten honeymooners to the cast of “Lost,” he got back to the island. In 1992, not long after he got his doctorate, he was hired as the first faculty member in a new marine science group at the University of Hawai‘i at Hilo. It was a busy time. He taught 15 different classes in the first two years, sometimes staying just a chapter ahead of the class. He started teaching two-week summer workshops in quantitative underwater ecological surveying techniques, or QUEST, training scores of divers to monitor the health of reef communities. He also gave public talks about coral reef conservation, ecology, and human impacts like pollution and overfishing. At a meeting in 1994, Lisa Choquette of Dive Makai, a scuba tour operator, told him aquarium collectors were destroying the West Hawaii reef, with many species of fish being harder to find. “This was the first I ever heard about it,” says Tissot. The issue had been simmering since the early ’70s, when the state required collectors to obtain permits and file monthly reports. In the ensuing two decades, several forces came to a head. Saltwater aquariums grew in popularity, aided by improvements in tank technology and jet travel that could speed colorful, tropical fish to pet stores. Permits and reports did little to slow collecting. But it did provide a paper trail of the trade’s growth, from fewer than 100,000 fish collected in 1973 to more than 400,000 in 1995. The bulk of collecting also shifted to the Big Island, as much of the reef around Oahu was overfished and destroyed by hurricanes in 1982 and 1992. At the same time, a growing number of tourists were visiting West Hawaii and availing themselves of snorkeling and dive services like Choquette’s, while many Hawaiians and mainlanders were moving to the Big Island. Tina Owens was among the newcomers, arriving from Oahu in 1993. Then, as now, the ocean was a huge part of local life, be it through snorkeling, scuba diving, catching word of a humpback whale on the Ironman triathlon swim course, or taking in the ocean view from homes along the flanks of Mauna Loa. “Here people have their faces in the water all the time,” Owen says one afternoon over lunch and a beer with Tissot at the Kona Brewing Co. The view out her scuba mask in the early ’90s was alarming. ABOVE THE WATER, scores of tourists are taking advantage of the 65-foot Kanoa II’s sybaritic delights: the high-dive platform, the 20-foot water slide, Mai Tai specials at the bar, lunch. Underwater, a fair number of guests in snorkels and scuba gear are drinking in the scenery that gives Hawaii’s coral reefs an estimated recreation and tourism value of nearly $400 million: strikingly banded butterflyfish, solid gold yellow tangs, and the parti-colored reef triggerfish, Hawaii state fish and owner of one of the longest Hawaiian fish names, Humuhumunukunukuapua‘a. Mullets shimmer past, possibly to escape a trevally. Playing rhythm to the chorus of bubbles and surf is the gentle ticking sound of black durgeon fish picking algae off the coral. Tissot surfaces, pops out his snorkel, and mentions a school of dark fish with bold orange splotches on and near their tails. But while the other fish seem abundant, Tissot says he can’t tell by simply looking if their numbers are up or down. That requires counting, which he started doing in the mid-90s as the aquarium debate gathered steam. At the state’s request, Tissot and a University of Hawai‘i colleague ran multiple, 50-meter transects, tallying fish on industrial-strength waterproof paper in two protected areas and nearby areas open to collecting. One pair of sites was by the Old Kona Airport, where Tissot first dove in 1980. The other sites were at Red Hill, a stone’s throw from the Kanoa II’s mooring. The results were dramatic. Seven species that accounted for 90 percent of the aquarium trade were significantly reduced in unprotected areas. The areas had roughly half as many moorish idols, Potter’s angelfish, longnose butterflyfish, and yellow tang. Four-spot butterflyfish were down 75 percent. Meanwhile, fish outside the aquarium trade were unaffected. Tissot shared his preliminary findings with a legislator who went on to forge legislation to ban collecting in certain areas. Owens’ coalition agreed to the compromise and in 1998, the legislature passed Act 306 barring collecting in “Fish Replenishment Areas” that covered more than 30 percent of West Hawaii. A broad-based fishery council—including collectors, dive tour operators, fishers, divers, and community representatives—picked nine areas covering 35 percent of the coast. A hearing on the replenishment areas drew more than 800 people and was the largest ever conducted by the Department of Aquatic Resources. More than 93 percent of the attendees supported the areas. But not everyone was happy. Tour operators and community members were upset that the new rules didn’t have enforcement provisions. And while the collectors are a small industry in Hawaii—four or five dozen people grossing less than $2 million a year by the latest estimates—they felt singled out for using what they thought was a seemingly limitless resource. At Tissot’s suggestion, Claudia Capitini ’03 MS canvassed the fishery council’s players for her master’s thesis and found the collectors felt the council’s conclusions were too heavily skewed by scientists. One collector told her, “there needed to be more than biology” behind the decisions. Capitini notes that similar asymmetries appear in other ecological disputes, like the debate over global warming. TISSOT IS NAVIGATING his rented Chevrolet Impala along the waterfront’s Ali‘i Drive on his way to a dive shop, then to Kahalu’u Beach Park for some snorkeling. He passes one of Snorkel Bob’s ubiquitous dive shops, and the thought of its owner and namesake, Robert Wintner, has Tissot seeing red. And purple. And green. As the aquarium fishery issue continued to simmer, Tissot started thinking about the reef’s people as well as its fish. He used something called “integral ecology,” which applies the theories of biochemist and New Age philosopher Ken Wilber and others to the human-nature interface, in this case, marine protected areas and their management. Woven into the map of quadrants are color-coded stages of development. They start with beige, which is akin to the selfish early years of a human’s life built around survival, warmth, and shelter. Two stages up is red—the impulsive self, aligning with power, taking what you need, being what you are, and doing what you want. The blue stage sees a life of meaning bounded by rules and law. In here, says Tissot, you can find politicians, law and order, organized religion, environmental regulation. Orange features incentive-based achievement, rationalism, science and knowledge. Stages above that start to recognize stages below and move toward a sort of broad-minded enlightenment. Environmental organizations are “all over the map.” The mainstream ones will be orange and blue. More radical environmental groups, like Friday Harbor’s direct-action anti-whaling group Sea Shepherd, are red. For that matter, Snorkel Bob, who sits on the Sea Shepherd board, is red too. TEN MINUTES before it is scheduled to start, the sign-in sheet for Tissot’s talk has a handful of signatures. But when it comes time to speak, nearly 50 people have filled the chairs. Their body language suggests they are a circumspect lot. One woman videotapes the proceedings with a small handheld camera. Tissot is wearing one of his dozen-plus aloha shirts, this featuring Hawaii’s state flower, bird, and tree. His speaking has the breathless quality of a nervous person, but the words come easily. When he asks how many people are divers, half the hands go up. He packs in a lot, first framing the West Hawaii fishery as part of a bigger picture that has 30 million aquarium fish coming from some 30 countries, but mostly the Philippines and Indonesia. Fishers will stun fish with cyanide and dynamite; run rough over reefs, and rove about, flaunting local laws. If the trade is banned in Hawaii, “probably one of the best managed systems in the world,” says Tissot, even more of it will move to less regulated areas of the globe. He recapped the late-90s research showing that seven of ten aquarium species were down in collected areas. “That says, ‘Yeah, collection does have a big impact,’” he says. But later, he shows how much that story changed once 35 percent of West Hawaii was closed and the fish had a chance to rebound. In less than three years, fish densities in replenishment areas shot up to be even with those of no-take areas. From there, the densities in each went up and down together in a cyclical pattern. Overall, the fish in the newly protected areas went up 74 percent. “They replenish fish very quickly,” Tissot says. Even more striking is work showing genetic relationships between parents and offspring that end up 15, 49, 140, even 184 kilometers away. Still, there are some species that have continued to fall off, a reason some managers and fish advocates are pushing regulators to create a “white list” of fish that can be caught. And both the number of permits and number of fish caught have roughly doubled since 1999, building the case to limit the entry of collectors into the trade. Such changes would be in keeping with adaptive management, the iterative decision-making process advocated by, among others, Compass and Gyroscope author Kai Lee. Near the end of his talk, Tissot puts up an image of Lee’s book. The compass, he explains, is science, data, monitoring. But the gyroscope comes from the public, which is all over the West Hawaii fishery—in the dozens of Fisheries Council members putting in tens of thousands of hours, in the local Division of Aquatic Resources workers, in the network of people swarming the Big Island, living with their faces in the water, and turning out for talks like this and others put on by the local Sea Grant. The resilience of the community, says Tissot, is key to the fishery’s sustainability. “I’ve never had two aquarium collectors in one night thank me,” Tissot says the next day. Snorkel Bob was a no-show. See the original article at Managing Nemo and don’t miss his web exclusive on A Brush with Snorkel Bob. Brian, if you’re shaping policy, you’re engaged in the debate. Why do you and Walsh want Hawaii to settle for 7, or fewer, yellow tangs per 100 sq. meters, when 25, or more, is the norm for an area that size? Why side with 30 fish collectors, 5 of whom are under investigation for poaching and coral crushing and one who’s been charged with terroristic threatening? Why not side with the vast majority of Hawaii residents who want AQ collecting to end?